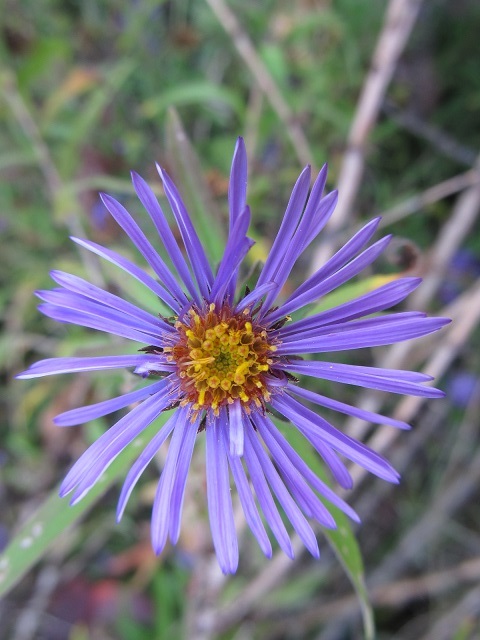 You can tell butterfly numbers are low when there are no butterflies on the summer farewell asters. Their numbers have been low all summer, and I’m not sure why. 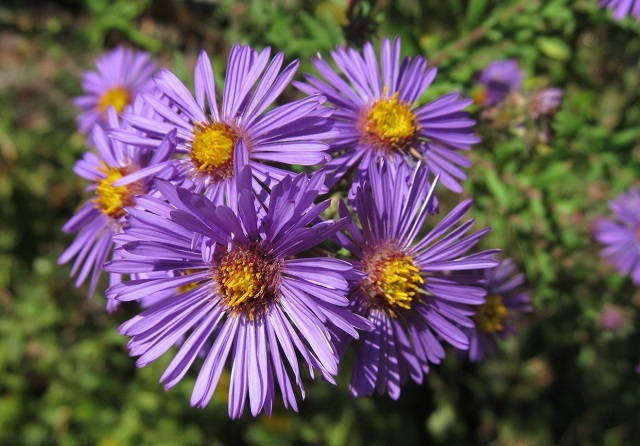 The asters grow to six or more feet tall. 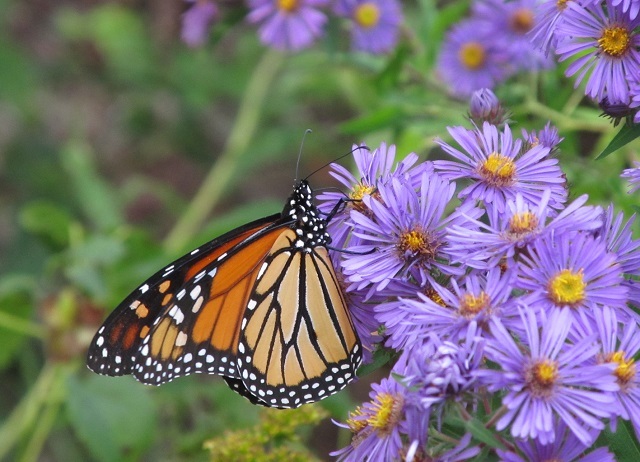 One summer they were in full bloom when the monarch butterflies were migrating south. It was so dramatic, I just couldn’t stay in the house. 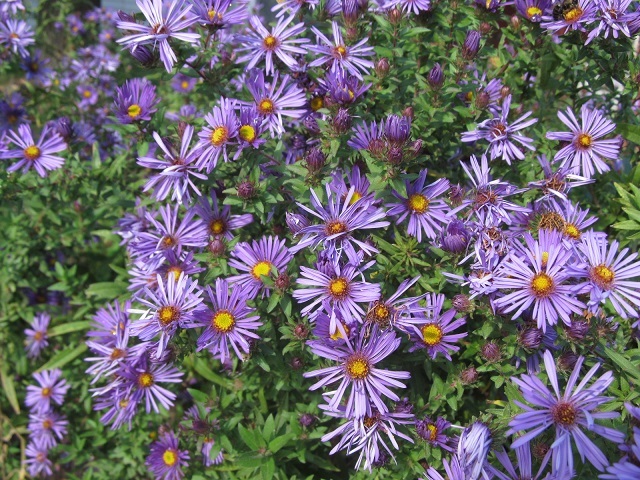 There would be up to 50 or more monarch fluttering around the asters at any one time! 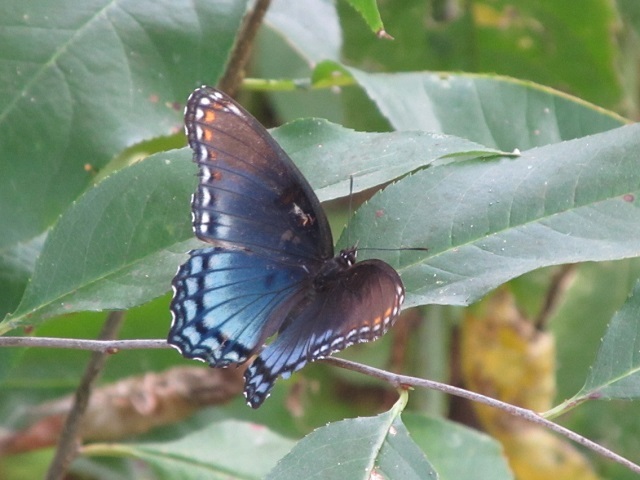 This morning started with watching a female red-spotted purple butterfly laying eggs in a young wild cherry tree. The female taps the leaves with her feet to be sure she’s in the right tree. 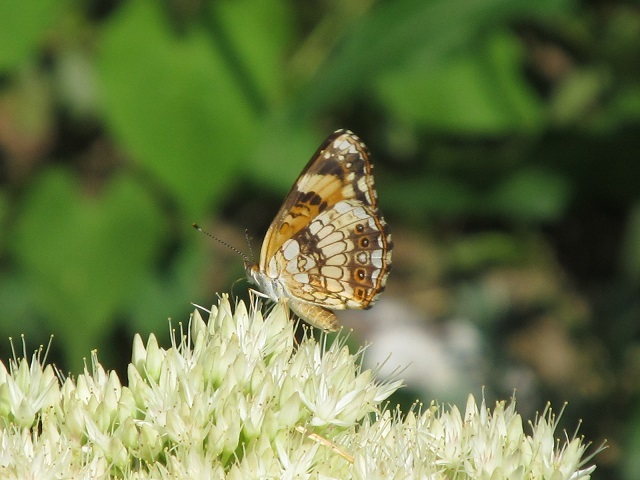 Butterflies smell with their feet. 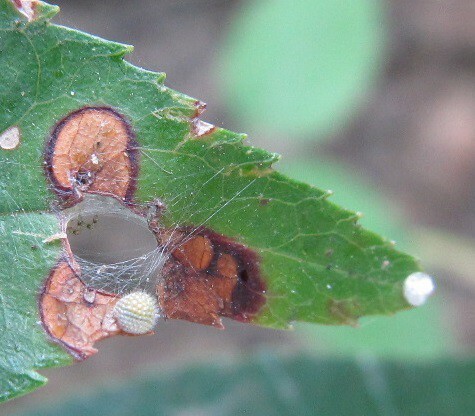 The egg on the left is definitely the egg of a red-spotted purple butterfly. Something’s not right with the egg on the tip of the leaf. This young wild cherry tree almost gets lost among all the other nearby growth nearby. All these pictures were taken in it. The caterpillar measured 5mm. The three I found were all approximately the same size. 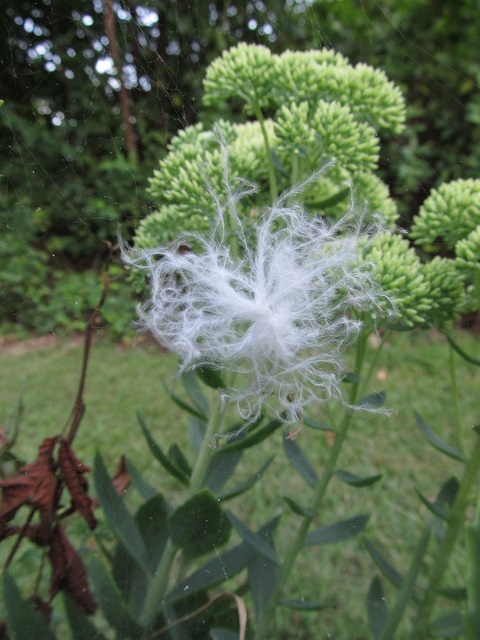 They usually dangle a small cluster of leaf pieces to attract attention away from the caterpillar. 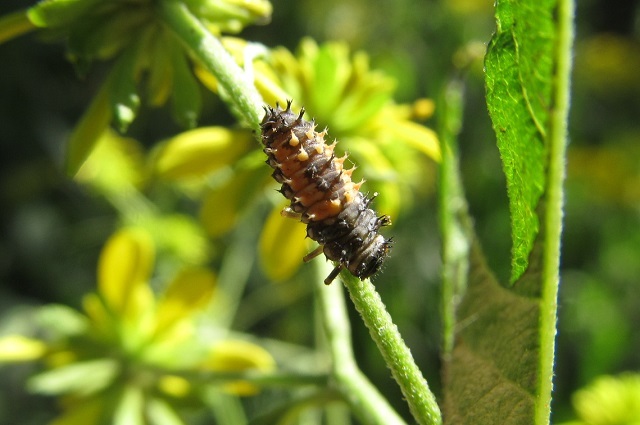 The predator must be an immature, just like the caterpillar. The position of the caterpillar looks like it’s either paralyzed or dead. 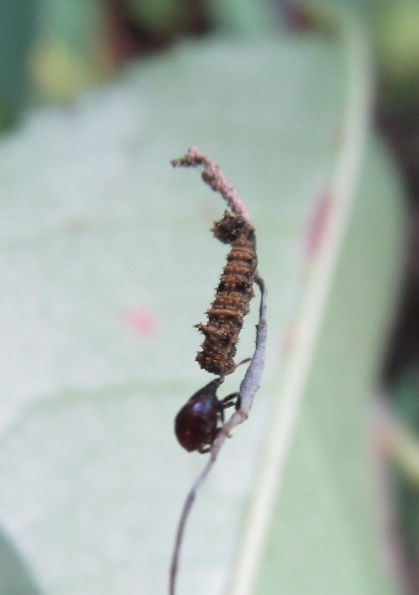 This last caterpillar looks a tad odd: maybe it just molted. 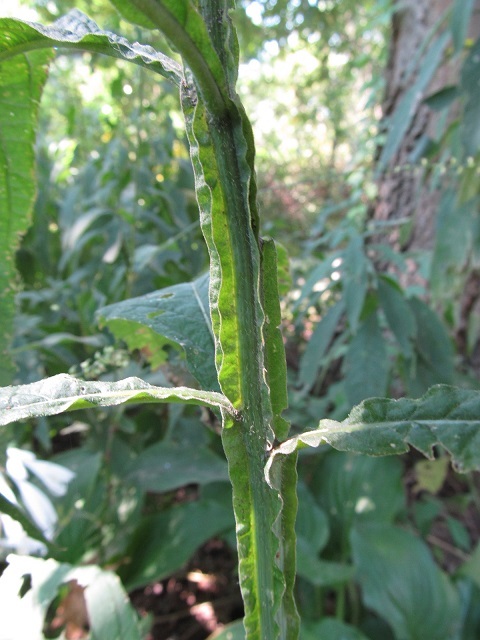 What looks like antennae, is a split from the drying vein of the leaf. 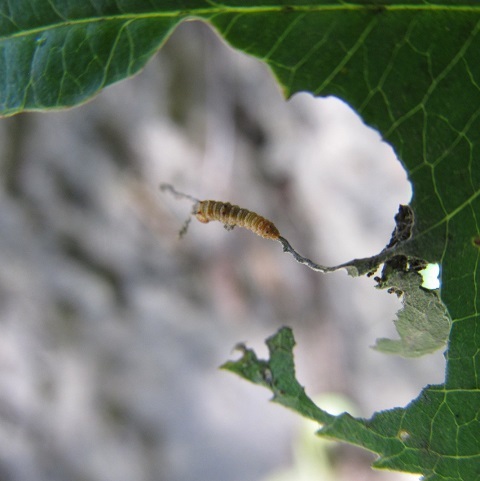 The way the leaf is cut away, the bare center vein and the dangling leaf pieces are definitely done by the caterpillar of red-spotted purple butterfly. 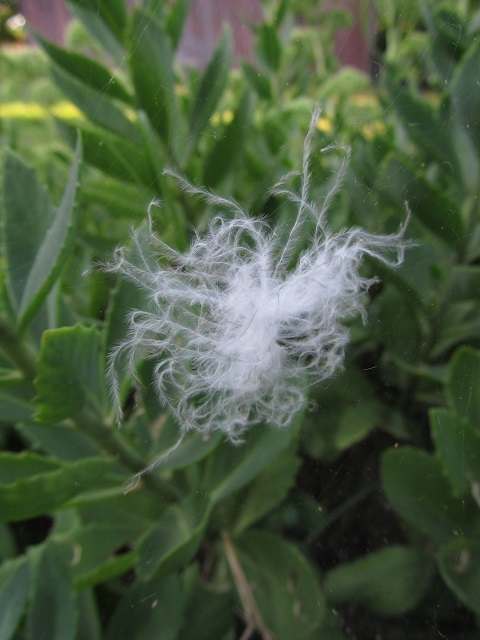 Imagine a teeny spider weaving a web in a sedum, and suddenly part of its web turns white! 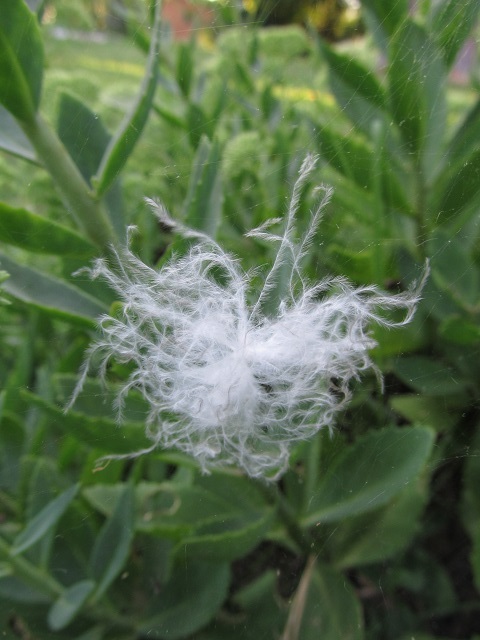 The downy feather measures about an inch in diameter. What’s a teeny spider to do? Today felt cooler than recent days. I just couldn’t stay inside. 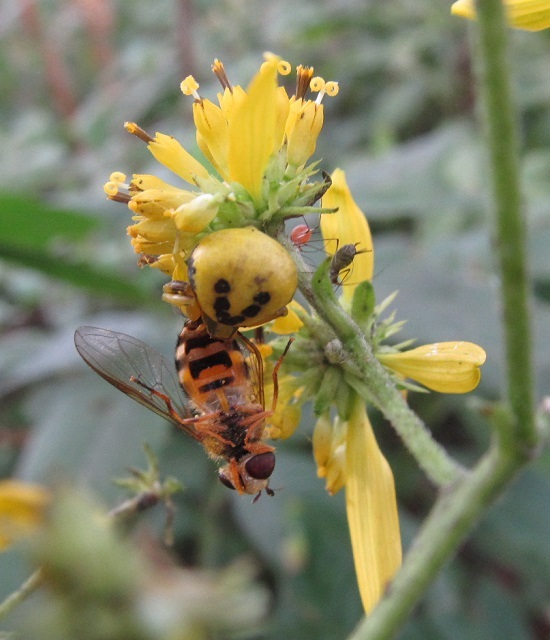 Seems like I spend a lot of time watching insect activity in the wingstem patch. 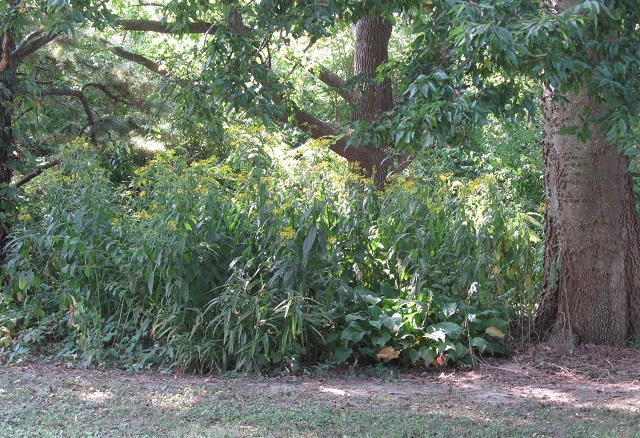 There’s a pine tree on the left of the patch, a sweetgum in the back and a hackberry on the right. 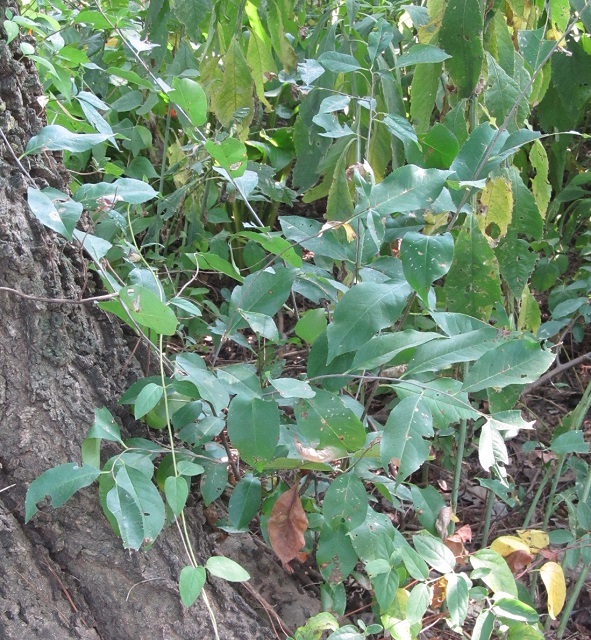 Gold moth (Basilodes pepita) caterpillars are relatively common. This is a younger version of the one above. 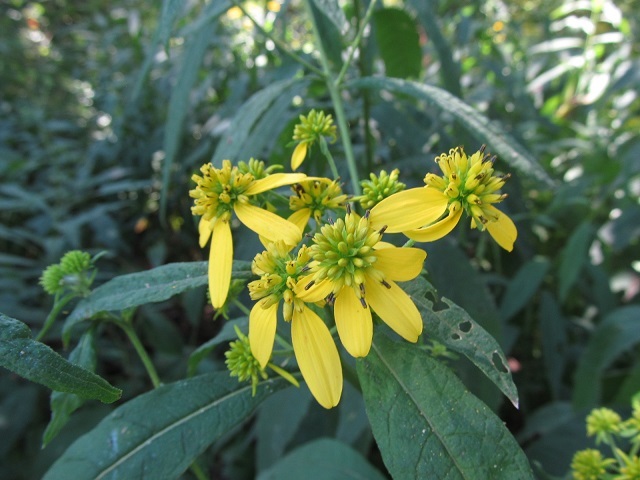 Wingstem flowers grow in clusters. 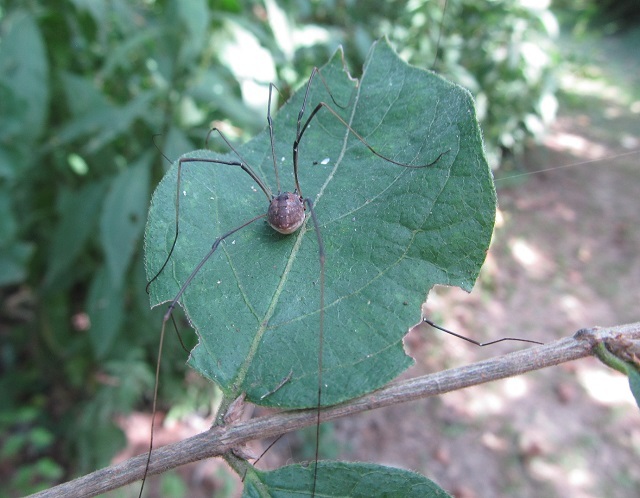 A daddy longlegs waits for prey to come close. 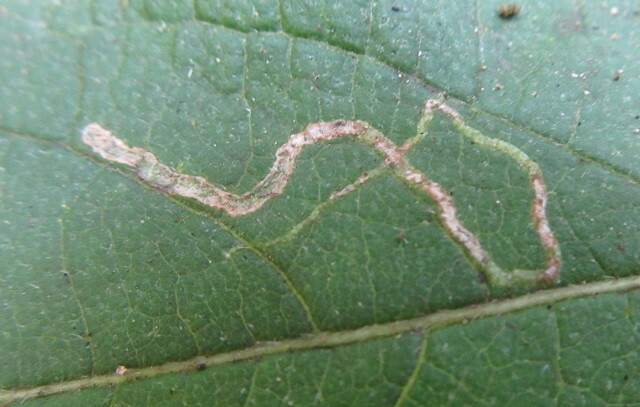 A leafminer leaves a trail to as they grow inside the leaf. 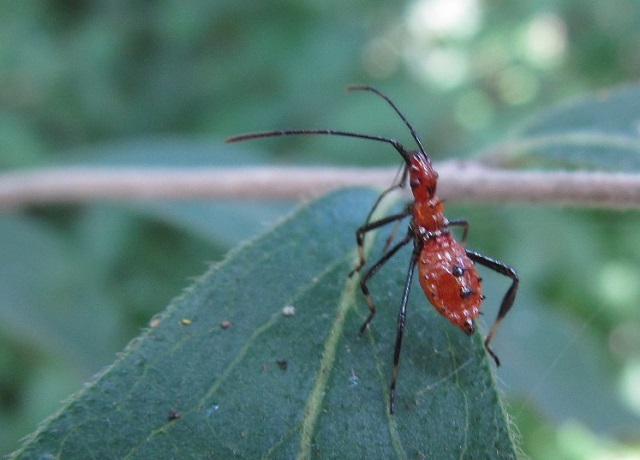 An immature ladybug doesn’t exactly look like a ladybug. 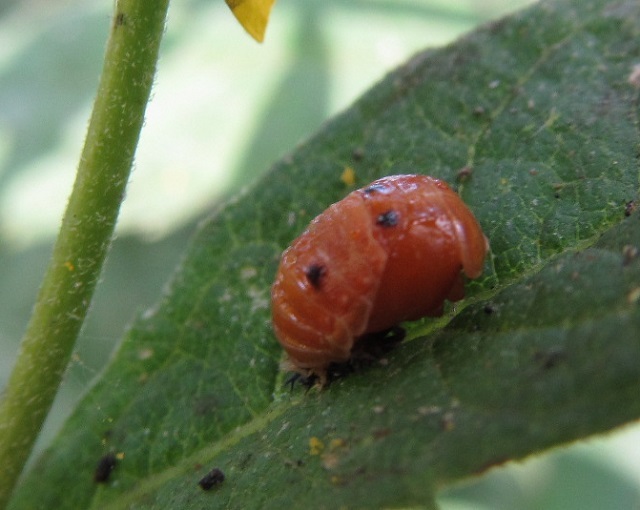 Neither does this next stage of an immature ladybug. before it’s full grown. This one caught a bee for its meal. 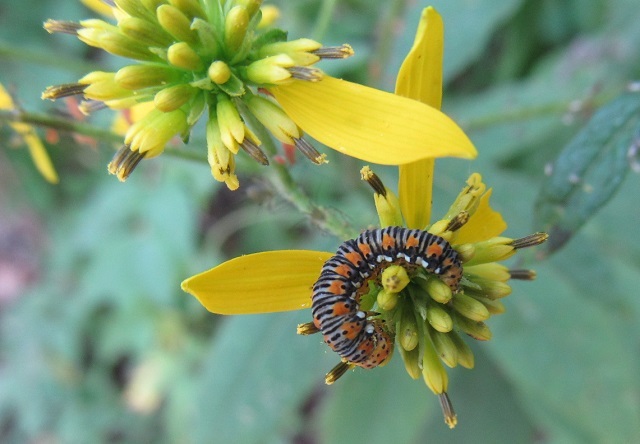 The silvery checkerspot butterfly lay their eggs on wingstem. Crab spiders have the ability to change color to match that of the flower they’re on. 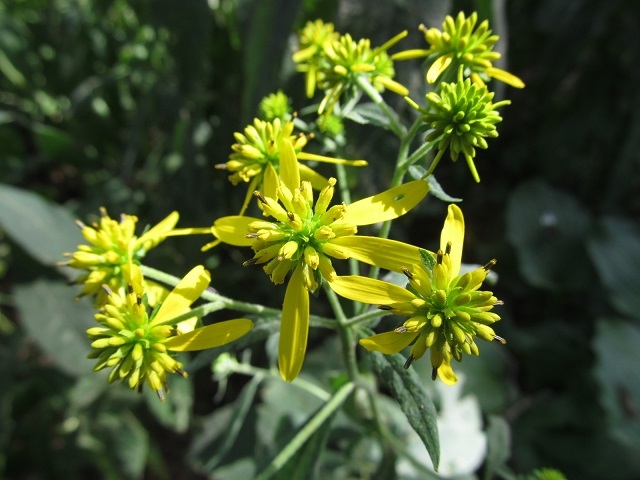 In this case, it’s among wingstem flowers. This is a female crab spider. Males are much smaller. 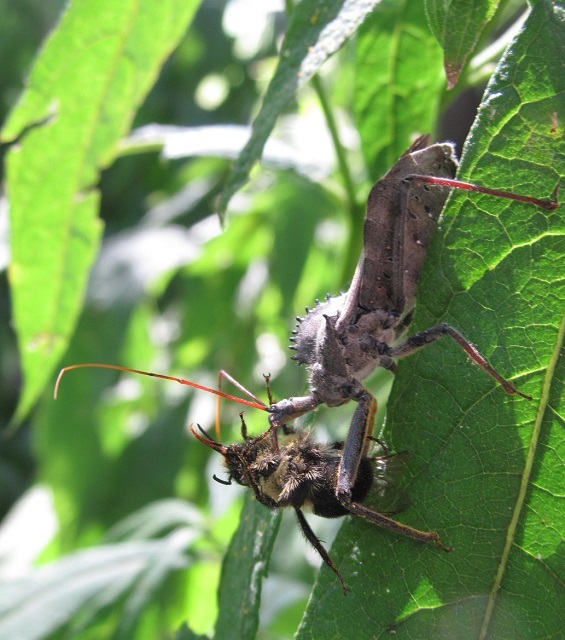 Her prey looks like a tachina fly. 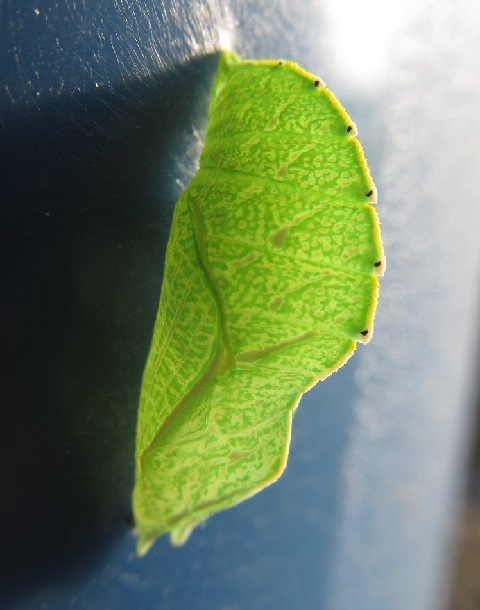 I blogged this chrysalis earlier this summer. It was attached to the side of our garbage container. 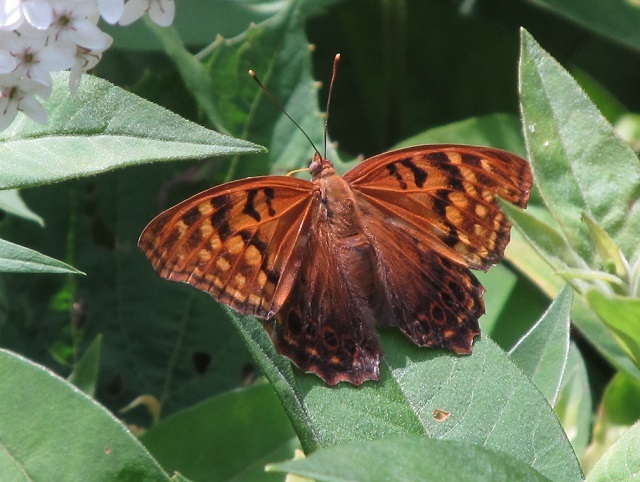 It belonged to a tawny emperor butterfly. 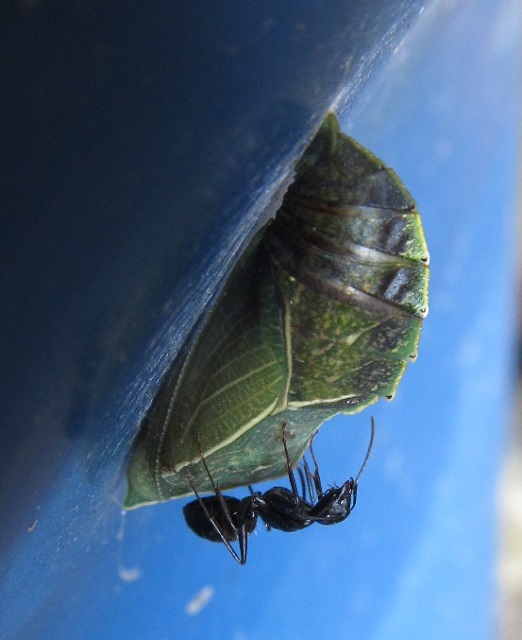 A couple of weeks later another chrysalis was attached to the side of the container. 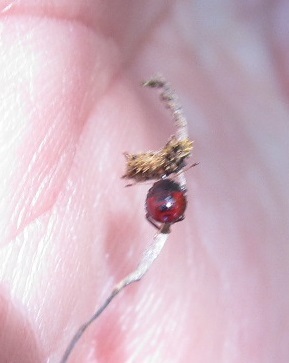 I knew it was parasitized when it started turning dark. Then came even another predator. 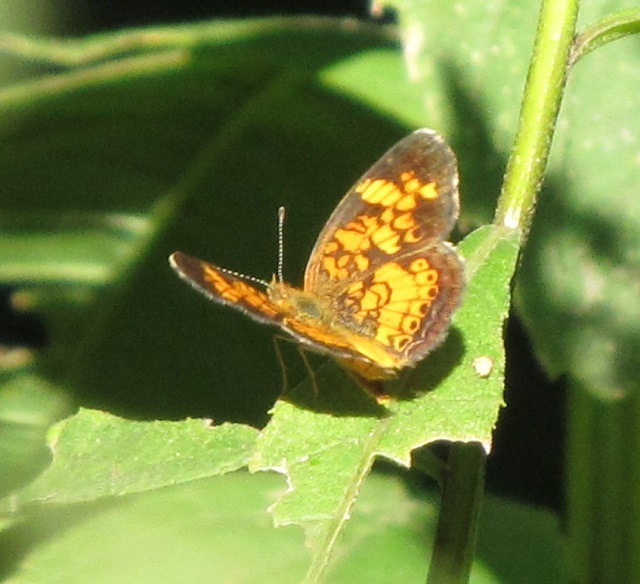 I wondered if the silvery checkerspot butterflies would visit in my gardens this summer. 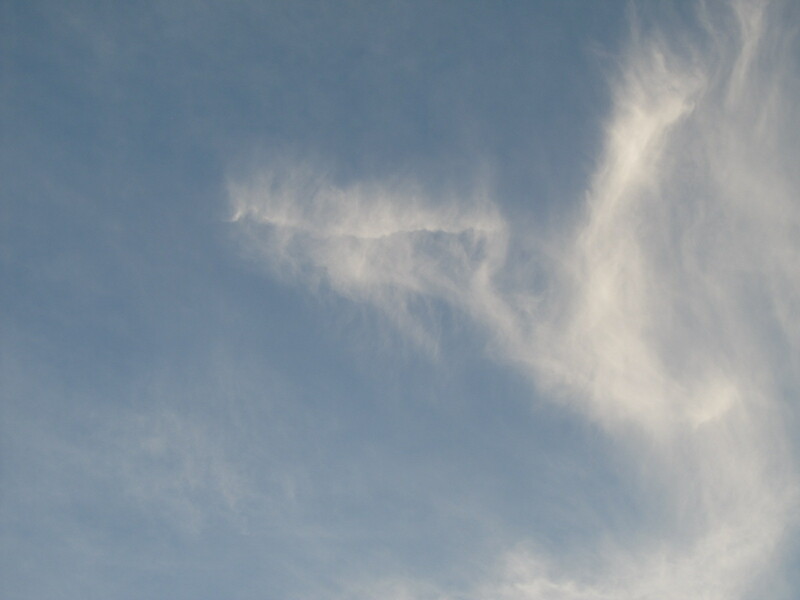 It seemed like they normally flew earlier. 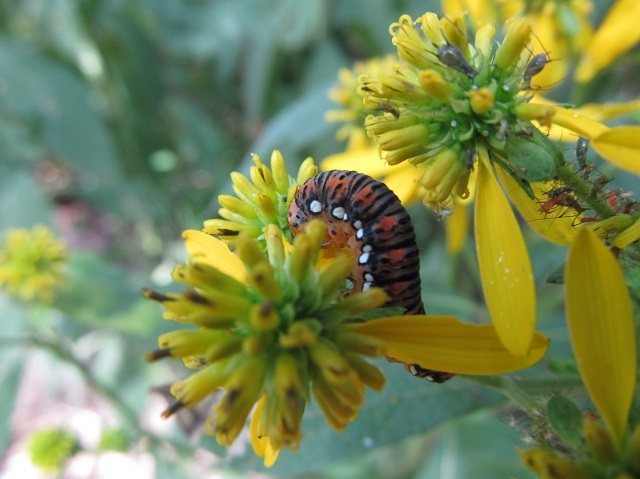 The silvery checkerspot butterflies lay their eggs on wingstem (Verbesina alternifolia). It’s easy to see where it got its name. I didn’t notice the resemblance when I first looked at this picture. 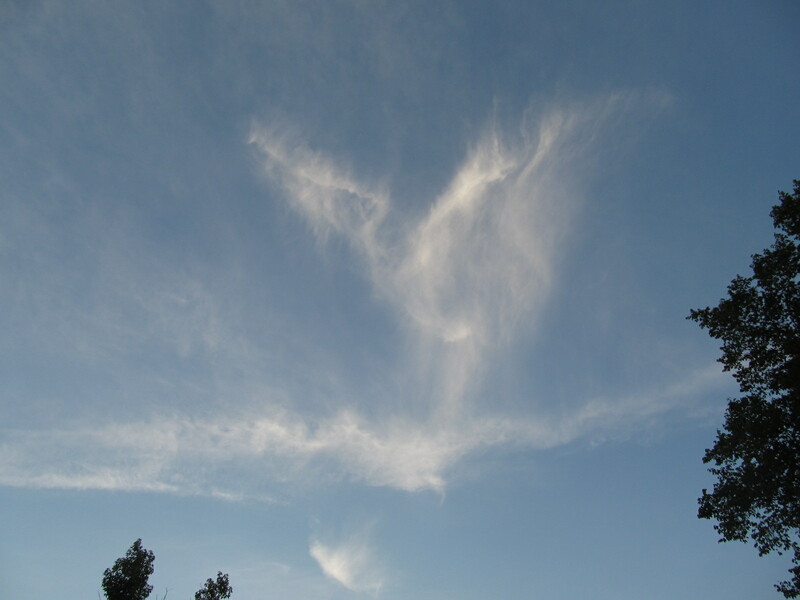 What kind of creature flies, disguised as a cloud?